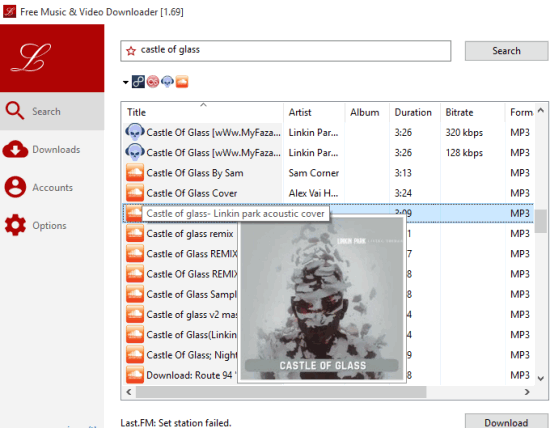 Here are 4 best free SoundCloud downloader software for Windows. These SoundCloud downloaders are really good to keep the backup of your favorite tracks or some other public music available on SoundCloud. These can also come in handy when your friend(s) gives you links of new SoundCloud tracks and you are working with desktop apps only. You don’t need to open the web browser again and again to Stream SoundCloud tracks. Some of these SoundCloud downloader software have some unique features as well. 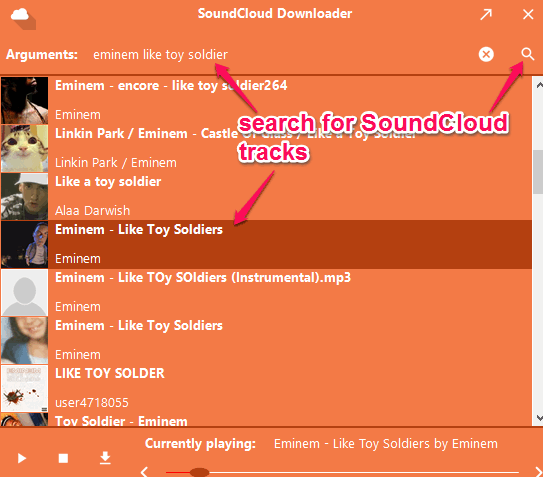 For example, you can play any SoundCloud song before downloading it to PC, search for any song, grab songs from some other music streaming website, etc. Let’s start with the very first SoundCloud downloader available in this list. This is my most favorite SoundCloud downloader software in this entire list. It has beautiful UI and two fantastic features: search option and built-in media player. You can find tracks using the keywords and listen to a track to check the audio quality and to find out if it is that particular track you were searching for. When you have found the track of your choice, you can begin the download process. The previous version of this software was only able to download SoundCloud tracks (one at a time) using the URL, but this latest version is advanced and far better. This new version is in beta, but I didn’t have any trouble using it. It is surely a good choice and comes with my recommendation. Lacey (also known as Free Music & Video Downloader) is a strong competitor to other SoundCloud downloaders in this list. It lets you bulk download SoundCloud tracks simultaneously. Maximum 10 tracks can be downloaded at a time together. After downloading the song, you can also listen to that song with its basic music player. You can search for SoundCloud tracks and it gives useful information in search results. You can read the title of track, Artist, Bitrate, Duration, Format, and Source. One of the great features of this software is that it also supports other music streaming websites (like 8tracks, Last.FM, Vimeo and much more) to search and download the tracks. I guess this software has all those features that most of us look for. 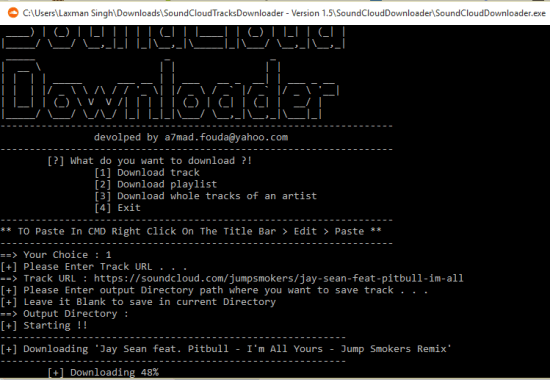 SoundCloudTracksDownloader has some different interface like Command Prompt and also comes with a very interesting feature. You can use this software to start downloading the entire playlist or a single track. Its interface shows the instructions that make it very easy to operate. The most important thing you have to do is to enter the URL of SoundCloud playlist or a song. After this, you can enter the command to set the destination location and begin the downloading process. SoundCloud Link Grabber works differently than any other software available in this list. It first lets you enter the link of a particular track and then generates download link for that track. So the process is a bit lengthy, but the work is done successfully by this software. There are no extra features in this software. It’s the simplest software in this whole list. You might also want to check its full review. Personally I use “Simple SoundCloud Downloader” and “Lacey” when I have to search for and download tracks available on SoundCloud. So these two software come under my recommendation for you guys. However, I must say that “SoundCloudTracksDownloader” is also a good choice as it can help you download the entire playlist.